During the summer of 2000 and into the spring of 2001 Odisea acted as one of two General Contractors (in partnership with Ed Haimes Construction) on a very unique and award-winning project located near Estes Park, Colorado. 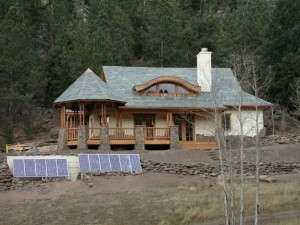 The project consisted of a weekend getaway “cabin” on a large parcel of land surrounded by National Forest. Access to the site was by 4-wheel drive along a poorly maintained forest access road approximately 8,000 ft (~2,450 meters) above sea level. The direction given by the clients was to construct a building that would last for hundreds of years. Cutting corners on systems and materials was not in their interest. Using straw bale walls on the exterior was part of the plan from the beginning and Odisea had extensive experience, especially with “load-bearing” bale walls, meaning that no wall frame system was to be used. The architectural design was provided by Rodwin Architecture of Boulder, Colorado and materials choices were guided by Sarah Francis of Sol Design. The project was the recipient of three design and construction awards within a couple years of its completion. Odisea performed all aspects of the project alongside Ed Haimes with the exception of drywall, roofing, timber-framing and masonry. 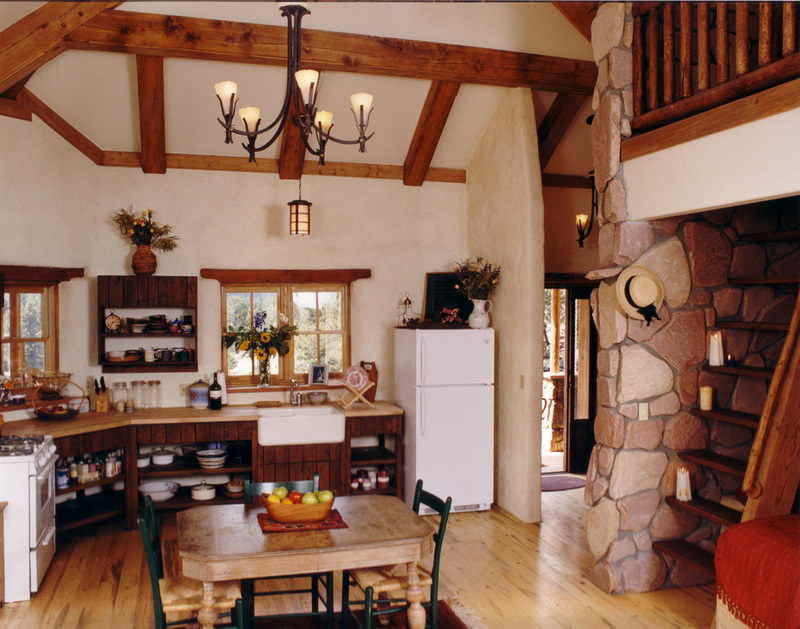 We installed the septic system, constructed the walls, wired and plumbed the mechanical systems, assisted with setting the timber-framed trusses, and installed the SIP panels, among many other tasks. We reported nearly weekly to the owners on our progress and held regular onsite meetings where materials and systems were decided upon and purchased. Design servies included structural engineering and design of the septic system (ISDS). This project lasted nearly one year due to the small crew, remoteness and complexity. It is a signature project we are proud to have in our portfolio and we thank the clients for allowing us to participate in their great vision.